I haven’t posted any Bearings sketches for a while… it seems sleep deprivation and World Cup excitement is conducive to his reappearance! 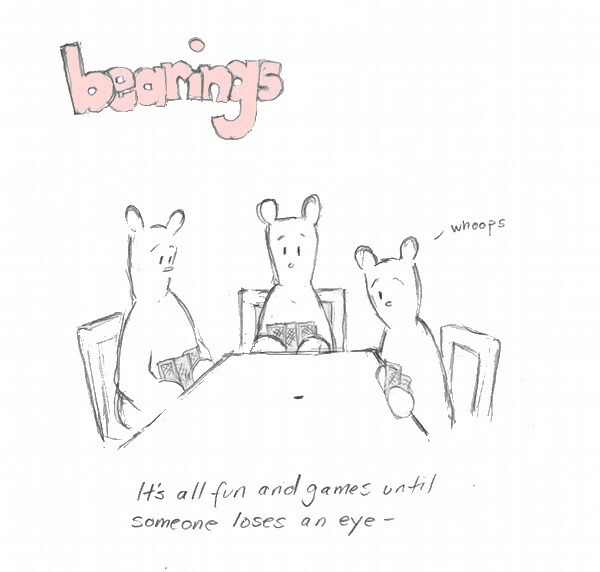 This entry was posted in Bearings Cartoons, Fluff & social commentary and tagged bearings cartoon, fun and games until someone loses and eye, philosophy webcomic, simon and finn by simonandfinn. Bookmark the permalink. Heh. Nice. Now I’m thinking about making drawings based on these kind of sayings/expressions. 🙂 There’s certainly a number of them! This made me chuckle 🙂 Thanks!! You are so clever!